Advanced process control (APC) refers to a broad range of techniques and technologies implemented within industrial process control systems. Advanced process controls are usually deployed optionally and in addition to basic process controls. Basic process controls are designed and built with the process itself, to facilitate basic operation, control and automation requirements. Advanced process controls are typically added subsequently, often over the course of many years, to address particular performance or economic improvement opportunities in the process. Process control (basic and advanced) normally implies the process industries includes chemicals, petrochemicals, oil and mineral refining, food processing, pharmaceuticals, power generation, etc. Advanced Process Control can improve product yield; reduce energy consumption; increase capacity; improve product quality and consistency; reduce product giveaway; increase responsiveness; improved process safety and reduce environmental emissions. 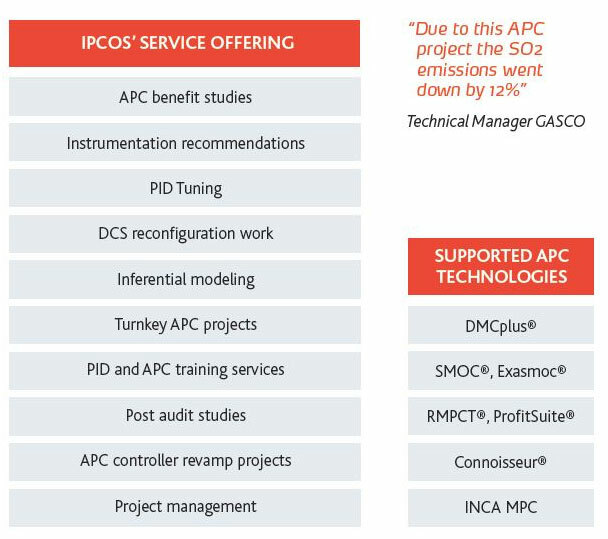 IPCOS offers these APC solutions across the world to different industries like the gas processing, refining, petrochemicals and the fertilizers industry.